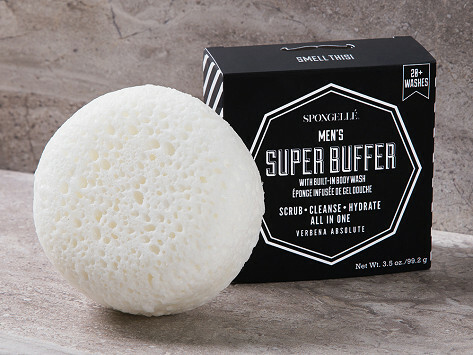 Spongellé Men's Super Buffer is an exfoliating sponge with premium shower gel and extracts built right in. Guaranteed for over 20 uses, it hydrates, massages, and rejuvenates your skin as it exudes the energizing scent of Verbena. Squeeze these sponges and the surface changes from an exfoliating texture to soft as silk. Dimensions (in packaging): 9" x 7" x 5"